Late last year, the Supreme Court changed some very important things about Arizona’s DUI laws. Now, where there was once little hope, qualified green card holding Arizona citizens have a better defense under the Arizona Medical Marijuana Act when being prosecuted for a DUI. A DUI lawyers or marijuana lawyer may be able to offer a better case to their clients facing DUI charges. Before getting into the law changes, it is important to understand exactly how DUI laws in Arizona work. In the state of Arizona, drunk driving laws are were made strict and are strictly enforced. It is prohibited to drive a vehicle while having a blood alcohol concentration (BAC) of .08 percent or more. Arizona is also a No Tolerance state, meaning that anyone under the age of twenty one while driving can be arrested for having any amount of alcohol in their system, even if it is under 0.08%. Commercial vehicle drivers such as semi truckers face a stricter limitation as well, and can be arrested for a DUI if their blood alcohol concentration is 0.04% or more. Arizona required all DUI offenders, even if it is their first offense, to use an Interlock Ignition Device in order to drive. Arizona ranks fairly low compared to other states when it comes to drunk driving arrests and drunk driving related traffic fatalities. This is because Arizona is very strict when it comes to enforcing DUI laws. 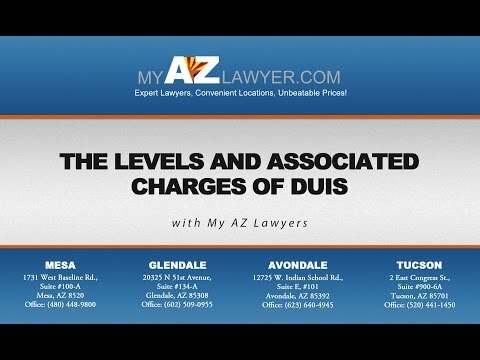 The most common DUI people in Arizona are convicted of are alcohol related DUIs. If you are caught driving while your blood alcohol content, or BAC, is over .08, the state will go hard on prosecuting you. “Metabolite” DUIs are another common type of DUI in Arizona. A metabolite is the substance your body processes marijuana into once consumed or smoked. Metabolites are often residual and may not have any affect on the sense or capability of a person while driving. If someone is driving in Arizona with marijuana or its metabolite in their body, they will be charged with a DUI. This is an unfortunate law for law abiding medical marijuana users. One could engage in medical marijuana hours before getting into their car, completely sober, but the metabolite in their body will be present. Should they get pulled over, they could be charged with a DUI while completely and totally sober. If that law seems a little unconstitutional, worry not. It has been removed from Arizona state law as of late last year. Now, the law has been changed. Nobody can convicted of a DUI solely because of the presence of a non-impairing metabolite in their body from previous use of marijuana. Unfortunately, even with this great change to the law, Arizona courts were not being especially cooperative with medical marijuana card holders. Little time and opportunity was given to defendants to explain that they were legal cardholders and not impaired while they were driving. Fortunately, this problem is being tackled. After making its way to the Arizona Supreme Court, a decision was made on how to properly handle the combination of medical marijuana issues and old methods of handling DUI cases. “Affirmative defense” was the ultimate result. Now, defendants can now actually defend themselves properly and showcase their legal holding of a medical marijuana card. The state has to still try to prove guilt beyond a reasonable doubt, but now the defendant is given the opportunity to prove their innocence in the matter. Some people see affirmative defense as burdensome and not the right solution to the medical marijuana DUI problem, as a defendant in such cases usually does not have to “prove” their innocence in the matter. Luckily, in most cases where cardholders can prove that they are legally able to use medical marijuana, have broken no laws while following rules involved in the substance’s use, and that they were not under the influence of the drug despite metabolite presence, defendants more often than not win their case. It is great to see this serious issue in Arizona law be put to rest. Now, innocent law abiding drivers will not be at risk for a DUI while completely sober and the focus can be put on cleaning up the streets of actual dangerous drunk driving. I need a good DUI lawyer in Arizona. Who can I call? My AZ Lawyers is a local Arizona law firm featuring a team of marijuana lawyers and DUI lawyers that will fight for you. We will match someone from our team of talented marijuana lawyers and attorneys that can walk you through Arizona’s medical marijuana laws and find the best direction for you case. Give My AZ Lawyers a call today to get started. What Happens When I Fail The Sobriety Tests And I’m Not Drunk?